It's an interesting topic. On one side I'm willing to believe that there may be some things that the human mind is capable of, like remote viewing, that are not undestood or even known. On the other side, none of the 'evidence' that has come to light so far seems credible. I don't doubt that the CIA or some other government agency tried it, if just because the russians also tried it, however, if something came out of it, they kept the compelling examples secret until know. remote viewing is exactly what shaman do ! they remote view where the animals are ! they tap into the energy of the planet and find it ! just because science cant explain doesnt make it any less real , I mean we cant effectively explain gravity any more than we can explain where consciousness comes from yet somehow we dismiss all the subjective states of consciousness , despite millions of humans repeating the same steps and getting the same results! Well Moby, I don't believe because they want me to believe, or some kind of suggestion. I became a believer because I experienced it. I suggest you try it before being so dismissive. Caution may be advisable for some people. I only say that because a good friend of mine dabbled with RV some twenty years ago - even having his own personal trainer - and was quite traumatised, eventually believing that other individuals were trying to psychically 'attack' him from afar. Of course that could all be standard clinical paranoia rather than reality, but the effect on his demeanour was undeniable despite being a very grounded individual beforehand. He's okay now but it took a while to recover from. His reason for dabbling? Gambling and accessing good tips at the bookies! Not a good starting point. 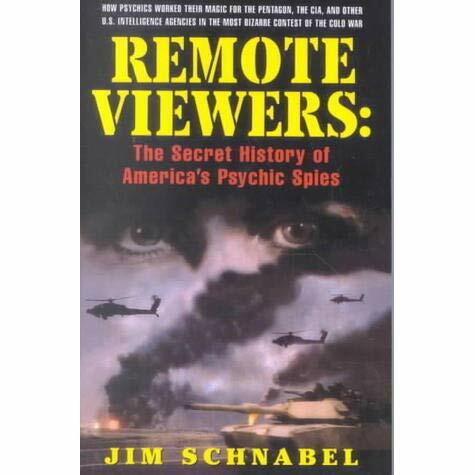 As for reading material, Jim Schnabel's 'Remote Viewers: The Secret History of America's Psychic Spies' is still top of the pile for me. You fell for a magic trick mentalists do things like that all the time. They dont really read your mind and you are not magically predicting anything. There is hundreds of ways to match your drawing to a picture. If you think your drawing was selected at random your wrong. Is this guy credible? What proof does he have? listen from 5:30 to 6:11, and there is your answer. It would have gone dark by now, after twenty years they would have got a few of the techniques nailed down, so if they had a good student with natural abilities that plus training would be enough. Hey dragonridr, I know what you're talking about but this wasn't the case here. There were probably around a hundred people involved, and there was no way for them to see/know what I drew; or what anyone else drew for that matter before the selection process started. Also the amount of detail in particular in the background was so spot-on that it was what really got me. Remember, I had no idea what I was suppose to draw. The image could have been anything; microscopic, macroscopic, animal, mineral, geometric, landscape, etc. Also my position in the room was about 2/3rds back, and about center. The room was somewhat dimly lit, so any kind spying would also be extremely difficult. FYI, not everyone got it. Some people were better than others; some not very good at all. But my first effort turned out to be my best with details matching. My second was good also, but not as good as the first. All I can say is I was fairly skeptical at first, and I was trying to determine if there was some sort of scam going on, or if it was real. My conclusion is that there really is something to it. My experience moved the dial for me from skeptic to believer. The phenomenon has something to it. How reliable it is seems heavily dependent upon the interpretation which is subjective and could be problematic for practical applications. By this I mean; if you didn't have an image to compare it to you might be somewhat lost. In the case of a landscape, you might get that it is a landscape, but not know where it is located unless it had a very unique well recognized feature. But I guess the pros. have worked on these issues to increase the reliability. Also the pros are probably people with natural above average psychic abilities. FYI, I didn't get swindled out of any money. I took my son there because he was interested (a weekend for father son bonding). Also I've been interested in it for a while, and I wanted a chance to discuss it with Dr. Targ & Dr. Puthoff . The Degree of Success was Debatable ?